Pretzel Logic's Market Charts and Analysis: Is Cyprus the Bad News We Were Watching For? Is Cyprus the Bad News We Were Watching For? In Friday's update, I noted the charts were suggesting a turn was approaching, and I speculated that there would be some type of "bad news" event hitting the press this week; I went a step further and speculated that the source of the news event might be the FOMC meeting on March 20. Score one for my interpretation of the charts -- but score zero for my speculation as to the source of the pending bad news (though, to be fair, it remains to be seen how my speculation regarding the Fed will pan out – though, I suspect the events of this weekend may alter their game plan). As it turns out, the source of bad news seems to have been a tiny country known as Cyprus, which is apparently part of the European Union, and in need of a bailout (act surprised!). I'm not going to berate myself for failing to include "bad news from Cyprus" in my speculations -- prior to this weekend, if someone had asked me to relay the totality of my personal knowledge regarding Cyprus, I would have said it was "probably some kind of tree." If pressed, I'd have added, "Or maybe a rap singer and/or the newest car from Hyundai." What's unique and frightening about the goings-on here is that the EU has asked Cyprus to levy a tax on the bank accounts of private citizens to help fund the bailout. Todd Harrison has written an excellent piece discussing all this in more detail (See: Cyprus: Has the Next Phase of the Global Crisis Arrived?). There are legitimate concerns this will set off bank runs across the Eurozone. One thought I would add to this discussion is that it's my belief that -- short of systemic failure, anyway -- European instability is actually bullish for U.S. markets. This may be counter-intuitive, but if the EU experiences bank runs, it's not as if European investors are going to withdraw all that cash and simply bury it in their backyards. The cash has to go somewhere. Ask yourself: If you were a European investor who felt your money was unsafe in Europe, where would you put it? Right or wrong, bubble or not, the U.S. treasury market and blue chip equities are still perceived as "safe havens," especially when seen in contrast with Europe. So some portion of any massive capital flight out of Europe is almost guaranteed to find its way into U.S. markets. That means even more liquidity flowing in, on top of the Fed's existing support. More fuel for the fire would help drive down treasury yields and help drive up equities. It's all relative, after all -- and basically, we're still the prettiest ugly kid on the block. If you are truly aware of the challenges facing the world, it's logical to have a tendency to be bearish these days. The danger for bears is it's tempting to view events like this as "confirmation" of a pre-existing bias, which can lead to over-trading one's convictions. Believe me, my "inner bear" wants to pounce all over these types of events, too. 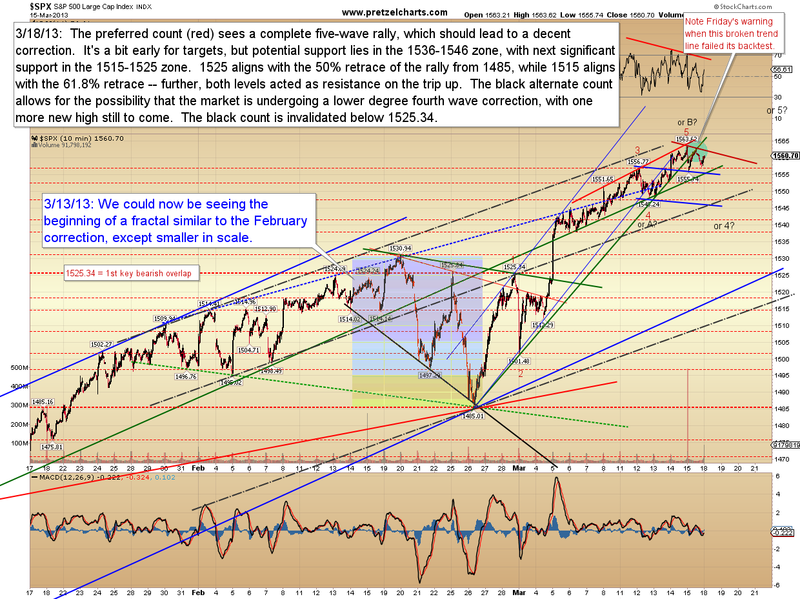 Could this be the watershed event that leads to a prolonged bear market? Sure, anything's possible -- but given how much liquidity is still flowing from the Fed, I think this event is probably simply yet another warning signal of an approaching storm. I suspect the storm hasn't actually reached us yet... in fact, based on the most probable interpretation of the charts (in my opinion, anyway), it's still some ways away. If you're prone toward a bearish bias, just remember to consider both sides of the equation. Bears tend to look at events like this and think: "Storm coming! And nobody wants to be the last guy standing on the beach when that hurricane rolls ashore!" But bulls think differently. A bull would say, "Sure. But then, nobody wants to cut short their vacation for a false alarm, either!" I covered my views on this psychology fairly well in an article in January -- one of my personal favorites of the articles I’ve written this year. It's titled A Survival Guide for Bears in a Bull's World. If you're aware of all the trouble in the world and are thus prone toward an intelligent fundamental bearish bias, I'd highly recommend giving it a quick read. Let's move on to the charts. The charts have been hinting that a correction was looming, which led to my speculation on Friday that bad news was forthcoming this week. To be fair, I was expecting about 6 or 7 more points out of this rally, but it remains to be seen if the market will achieve that or not. 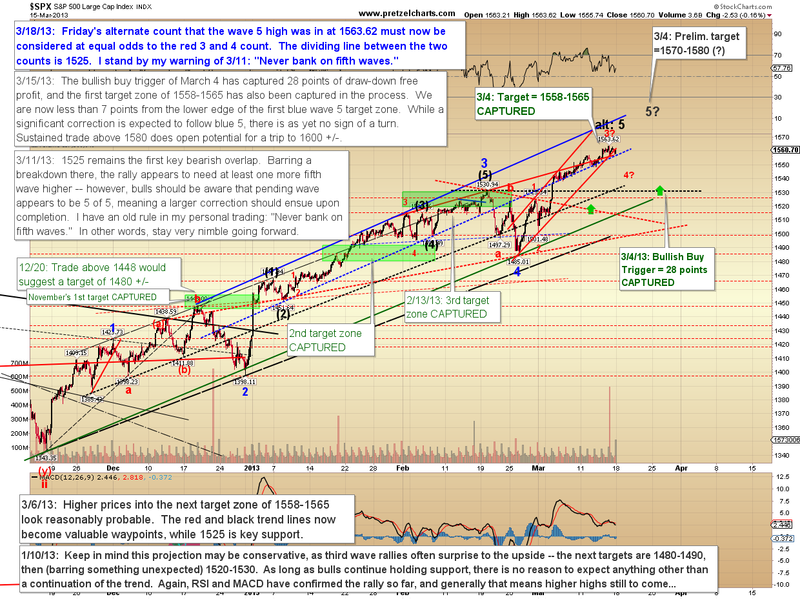 For a wave as large as this rally, a peak that falls 6-7 points shy of targets would be well within the margin of error. So on the chart below, I have kept Friday's alternate count (of wave 5 complete at 1563.62) unchanged in the labeling, but the odds on that count must be considered at 50% after the overnight futures sell-off. Since the two counts are being viewed as equals, the chart below shows how the wave could be viewed as entirely complete. We'll simply have to see how the cash market responds today. In any case, hopefully my warnings of the past several days have helped readers protect themselves and lock-in profits. In conclusion, I wrote on Friday that I was on “high alert” for a turn, so the bad news out of Cyprus isn't entirely unexpected. The news fits the charts, which continue to suggest bears may get a solid, scary correction here. It's still too early to determine much in the way of probable targets, or even to sort out if this is the smaller degree fourth wave -- but if we've indeed seen the completion of the fifth wave in its entirely, then the high 1400's would be entirely reasonable. Ultimately, however, I presently do not believe this will mark a long-term peak, though the market always reserves the right to change my mind. In any case, after we see how the cash market responds, I may be able to generate some preliminary near-term targets for the next update. Trade safe. Hardly, its just an excuse for more pumping and printing by the Beard. You the Man, Jason. Great call! I have been following you for about four months now. Have learned so much! I so appreciate your thoughtful, informative, yet down-to-earth posts. Thank you!